I am currently re-reading this book after four years and I find it as thought-provoking and well-written as I did when reading it with fresh eyes. The following excerpt is about how Ishmael (the gorilla) introduces the topic of his lesson to his new pupil: the unnamed narrator. There are times when having too much to say can be as dumbfounding as having too little. I could think of no way to respond adequately or gracefully to such a tale. Finally I asked a question that seemed no more or less inane than the dozens of others that occurred to me. I blinked and told him I didn’t know. Ishmael smiled, revealing a great mass of ivory–colored teeth. I hadn’t known he could, until then. “You may have any number of moments,” he replied gravely. 1 – I will be away for the next month or two. So I will probably not be able to moderate any comments from new readers. Sorry about this. 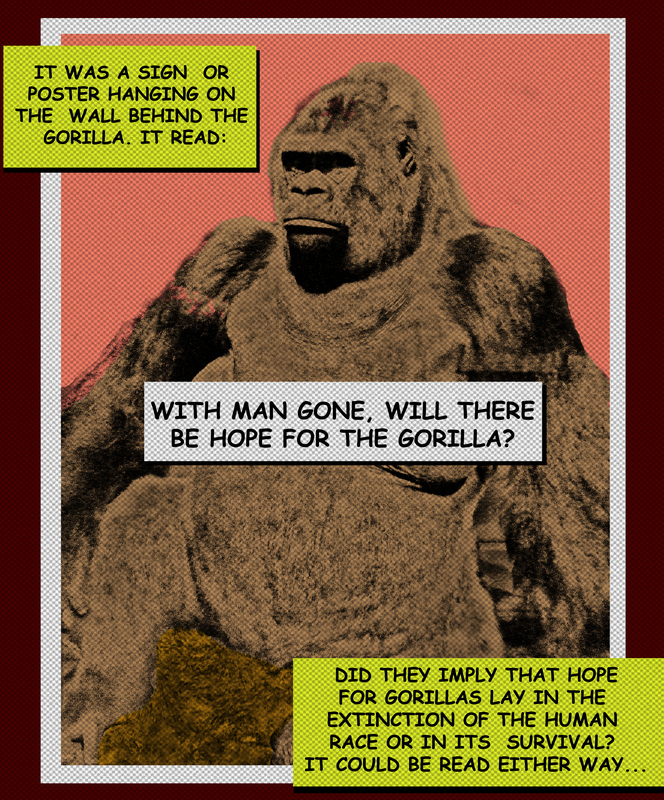 2 – For those who are interested, the gorilla in the comic is the specimen in the Natural History Museum in London. His name was Guy the Gorilla; you can read his cool history here. This entry was posted in Comics, Eco-philosophy, Environmental consciousness, Environmental literature, Environmental politics, Ethics. Bookmark the permalink.